In late 2012 and early 2013, companies were allowed, for the first time, to apply for new TLDs (Top-Level Domains). There was a lot of press about big companies buying swaths of TLDs – for example, Google bought .google, .docs, .youtube, and many more. The rest of us heard the price tag – a cool $ 185,000 – and simply wrote this off as an interesting anecdote. 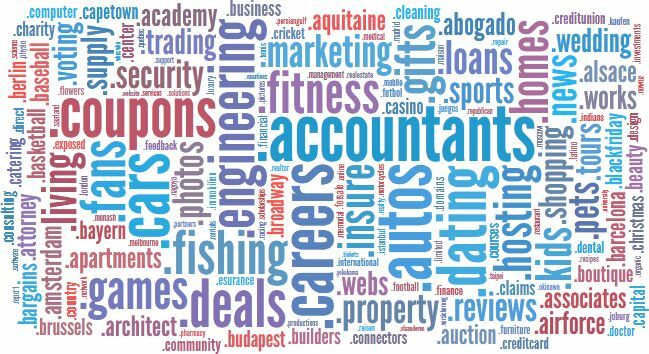 What you may not realize is that there’s a phase two, and it’s relevant to everyone who owns a website (below: 544 new TLDs – cloud created with Tagxedo). You may have assumed that these TLDs would simply be bought up and tucked away for private use by mega-corporations, Saudi Princes, and Justin Bieber. The reality is that many of these TLDs are going to go live soon, and domains within them are going to be sold to the public, just like traditional TLDs (.com, .net, etc.). I talked to Steve Banfield, SVP Registrar Services at Demand Media (which owns eNom and Name.com), to get the scoop on what this process will mean for site owners. Understandably, ICANN is reluctant to simply release hundreds of TLDs into the wild all at once and upset the ecosystem. As the TLDs have been granted, they’ve been gradually delegated to the global DNS and are coming online in batches. As each TLD becomes available, it has to undergo a 60-day “sunrise” period. This period allows trademark holder to register claims and potentially lock down protected words. For example, Dell may want to lock down dell.computer or Amazon.com may grab amazon.book. These domains must still be registered (and paid for), but trademark holders get first dibs across any new TLD. Trademark disputes are a separate, legal issue (and beyond the scope of this post). Some registrars will allow pre-registration during or immediately following the sunrise period. While you can’t technically register a domain without a trademark claim during the 60 day sunrise, they’ll essentially add you to a waiting list. This gets complicated, as multiple registrars could all have people on their waiting list for the same domain, so there are no guarantees. Some registrars are also charging premium prices for pre-registration, and those premiums could carry into your renewals, so read the fine print carefully. When do the new domains go on sale? The first group of domains began their sunrise period on November 26, 2013, and it ends on January 24, 2014. After that, additional domains will come into play in small groups, throughout the year. To find out about any particular domain/TLD, your best bet is to use a service like Name.com’s TLD watch-list, which sends status notifications about specific domains you’re interested in. Your own registrar of choice may have a similar service. The specifics of any given TLD will vary. Unfortunately, it depends. Each TLD can be priced differently, and even within a TLD, some domains may go for a premium rate. A few TLDs will probably be auction-based and not fixed-price. Use a watch-list tool or investigate your domains of choice individually. What kind of a land grab can we expect? With over 500 TLDs in play over the course of months, it’s nearly impossible to say. Some domains, like .attorney, will clearly be competitive in local markets, and you can expect a gold rush mentality. Other domains, like .guru may be popular for vanity URLs. Regional and niche domains, like .okinawa or .rodeo are going to have a smaller audience. Then there are wildcards, like .ninja, that are really anyone’s guess. Naturally, as a Moz reader, you may be wondering what weight the new TLDs will have with search engines. Will a domain like seattle.attorney have the same ranking benefit as a more traditional domain like seattleattorney.com? Google’s Matt Cutts has stated that the new TLDs won’t have an advantage over existing domains, but was unclear on whether keywords in the new domain extensions will act as a ranking signal. I strongly suspect they will play this by ear, until they know how each of the new TLDs is being used. In my opinion, exact-match domains are no longer as powerful without other signals to back them up, and it’s likely Google may lower the volume on some of the new TLDs or treat them more like sub-domains in terms of ranking power. In other words, they’ll probably have some value, but don’t expect miracles. What will matter is the memory of the end user and branding. Which is better: hilton.com or hilton.hotel, chevrolet.com or chevrolet.cars, coors.com or coors.beer? Today, it’s easy to say the .com is “better” for brand recall, but over time we’ll have to see which works better for brand marketing. My conservative opinion is this – don’t scoop up dozens of domains just in the hopes of magically ranking. Register domains that match your business objectives or that you want to protect – either because of your own trademarks or for future use. If you hit the domain game late and have a .com that you hate (this-is-all-they-had-left.com), it might be a good time to consider your options for something more memorable. Todd Malicoat wrote an excellent post last year on choosing an exact-match domain, and I think many of his tips are relevant to the new TLDs and any domain purchase. Ultimately, some people will use the new TLDs creatively and powerfully, and others will use them poorly. There’s opportunity here, but it’s going to take planning, brand awareness, and ultimately, smart marketing.